Pissarro’s importance resides in his contributions to both Impressionism and Post-Impressionism. Pissarro is the only artist to have shown his work at all eight Paris Impressionist exhibitions, from 1874 to 1886. He „acted as a father figure not only to the Impressionists“ but to all four of the major Post-Impressionists, including Georges Seurat, Paul Cézanne, Vincent van Gogh and Paul Gauguin. During his lifetime, he only sold few of his paintings. By the 21st century, however, his paintings were selling for millions. peintre (1830-1903). L.A.S. à Armand Gautier Pontoise. 8vo. 2 pages. A mon cher Gauthier [sic] ". 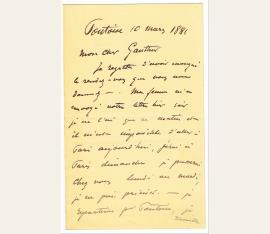 Armand Gautier était un peintre de l'entourage des l'impressionnistes, très lié à Gustave Courbet avec qui il fréquentait la brasserie Andler, où il rencontra Camille Pissarro. Gautier introduisit dans les milieux artistiques de l'époque le Docteur Gachet, qui devint le médecin attitré de Pissarro et sa famille. " Je regrette d'avoir manqué le rendez-vous que vous me donnez. Ma femme m'a envoyé votre lettre hier soir, je ne l'ai que ce matin et il est impossible d'aller à Paris aujourd'hui, j'irai à Paris dimanche je passerai chez vous lundi ou mardi je ne puis préciser. Je repartirai pour Pontoise, je travaille ici. Bien à vous. 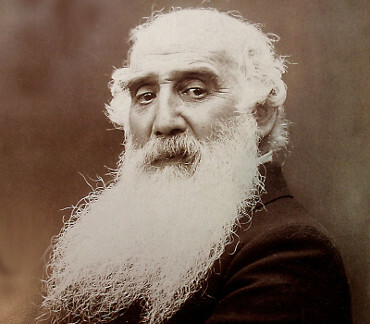 C. Pissarro. A l'Hermitage Pontoise Seine et-Oise "..
painter (1830-1903). 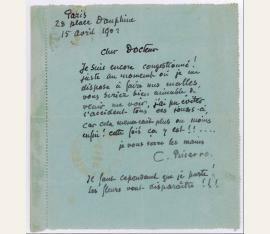 Autograph Letter Signed ("C. Pissarro"). 8vo. 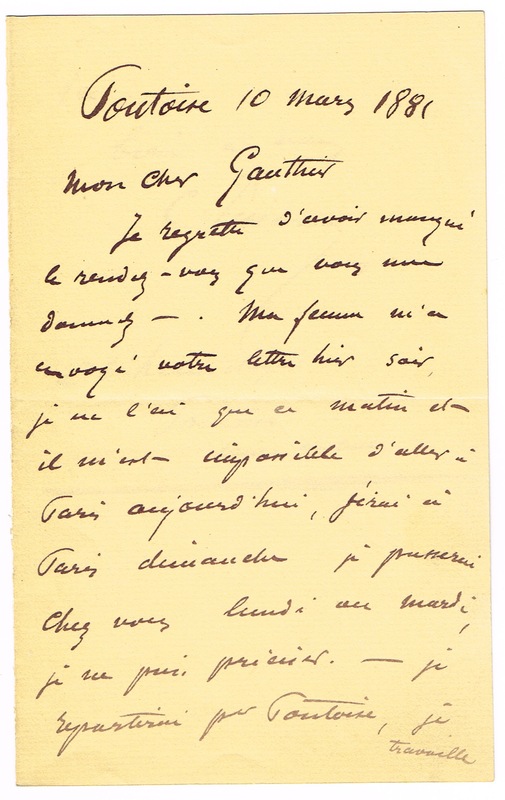 1 p.
The Impressionist painter writes to his friend, the antiquarian and collector Eugène Baillet (1829-1906). Pissarro solicits his opinion on two objects which belong to someone at the Hotel Garnier: a [Limoges] enamel which purports to be from the school of Raymond and a miniature from the time of Charles X. If Baillet cannot come at the suggested time, he should ask to see Jean at the hotel who will show him the objects. 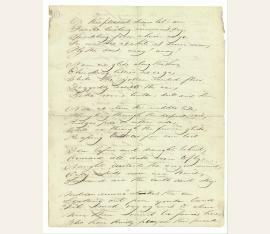 - With original transmittal envelope. painter (1830-1903). 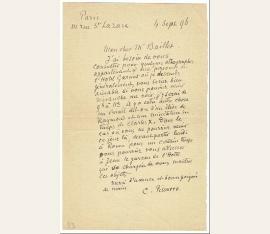 Autograph letter signed ("C. Pissarro"). Paris. Small 4to. 1 p. On a self-contained addressed mailing sheet. 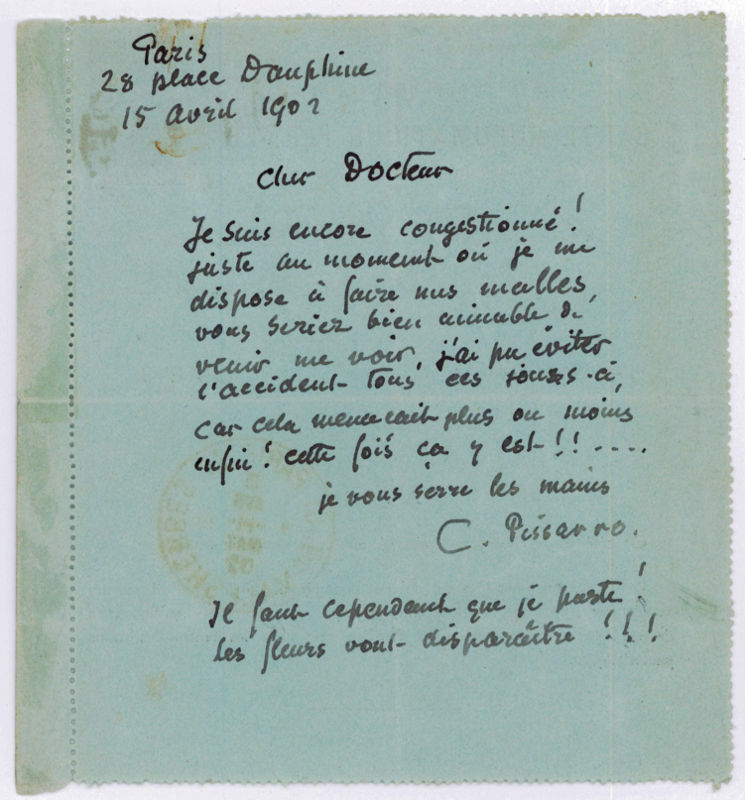 To his physician, Dr. Parenteau, asking him to come and see him before his departure because of a congestion: "Cher Docteur. Je suis encore congestioné! Juste au moment où je me dispose à faire mes malles, vous seriez bien aimable de venir me voir, j'ai pu éviter l'accident tous ces jours-ci car cela menacait plus ou moins enfin! Cette fois ça y est!! Je vous serre les mains". - Under his signature, Pissarro adds a brief postscript, giving the reason for the urgency of the matter: "Il faut cependant que je parte! Les fleurs vont disparaître!!!". - In very good condition; with central horizontal and vertical fold, a bit of mild toning, rusty paperclip mark along top edge, adhesive residue along left edge, and show-through from postmarks and printing on reverse.. In French, from the formative years of the Impressionist movement: "Would you have the kindness to do me a great service? I received a personal invitation from Berlin for an exhibition by an association I’m not familiar with: the Verein Berliner Künstler [Association of Berlin Artists] at Bellevue St. 3. Because I don't know anything about them would you be so kind as to tell me if that Association is trustworthy and whether my paintings might not clash with the artists who exhibit there. Please excuse my troubling you. I count on your discretion. I’ve thought about your little painting and corresponded with our friend [art dealer] Portier on the subject but he's had a relapse and is bedridden. I learned this morning that he’s doing better and I hope that we'll still be able to pursue our little transaction." 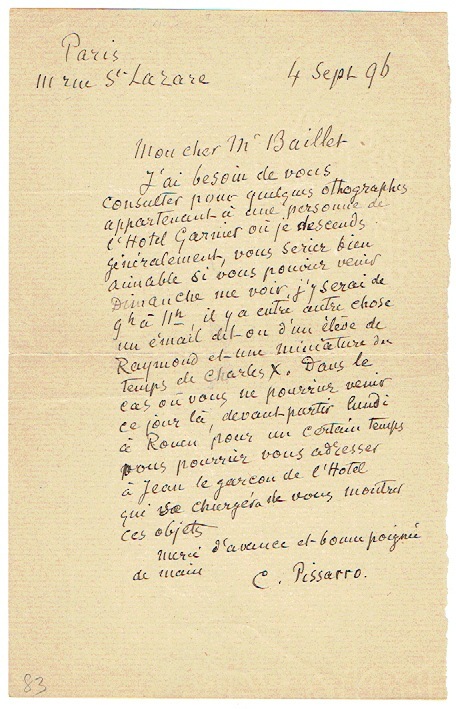 The mention of the invitation from Berlin places this letter around the time of Pissarro’s involvement in the Association of Berlin Artists exhibition in 1892. This would mark Pissarro's first exposition of this size, an event that the artist himself claimed as a “sensation” - while others, notably the dean of the conservative Berlin artists group, Adolf von Menzel, proclaimed his disdain and rejection of the Impressionist cause. - In fine condition, with a couple light rusty paperclip marks to left edge.